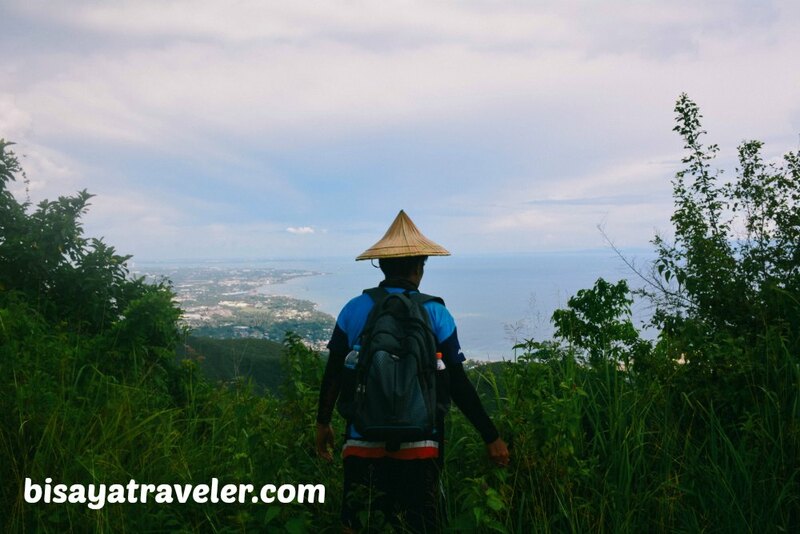 With today’s groundbreaking technology, it’s fairly easy to spot a place that you want to visit and see. In just a few of taps on your smartphone, you’ll get every important piece of information you need for that place. From addresses and contact numbers to the modes of transportation, you can practically see whatever it is you need online nowadays. 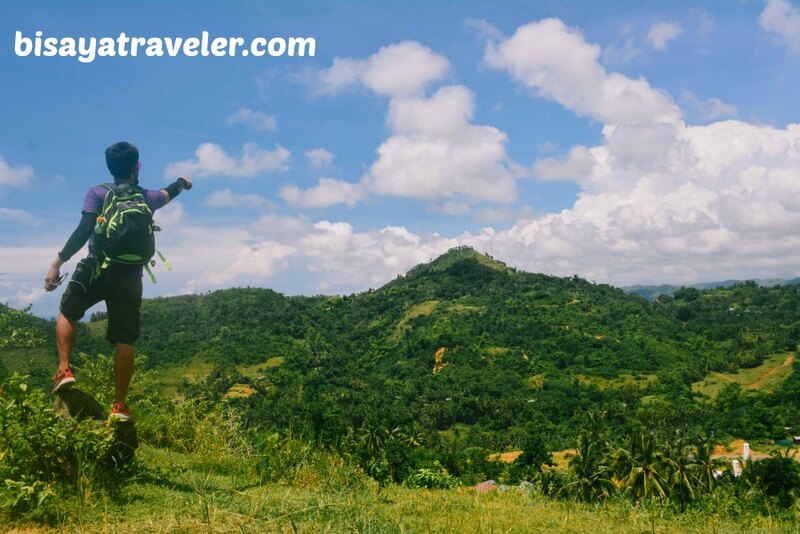 Like most millennials would say, Google has answers to everything, even when you’re looking for hidden pristine peaks and local secrets like Pangiltan Peak. And yes, I did a bit of research on Google about Pangilatan Peak, last month. After a Facebook user posted a photo of Pangilatan Peak online, I didn’t waste any time, and opened my laptop to search for any data about the mountain. Did the online world help get the answers to my question, though? Sadly, Google has yet to locate the real whereabouts of Pangilatan Peak. On our first attempt to reach the mountain, we didn’t get to see the real Pangiltana Peak, and instead discovered another photogenic mountain – Mount Magdook. And by the way, I’m not putting the blame on Google, for not giving us the ultimate solution. As far as I know, Pangilatan Peak has just been discovered, and only a handful of people know where exactly it is. 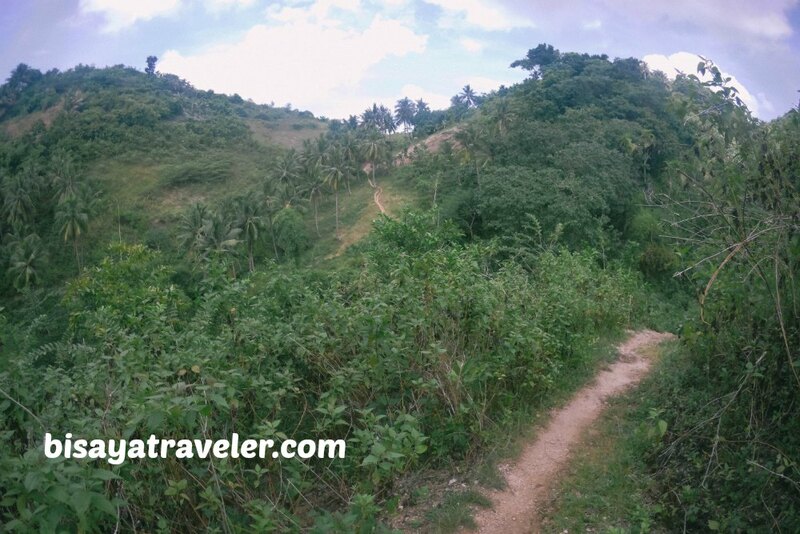 Fortunately, a friend of mine – Bo Jec – gave me some hints about the trail leading to Pangilatan Peak. 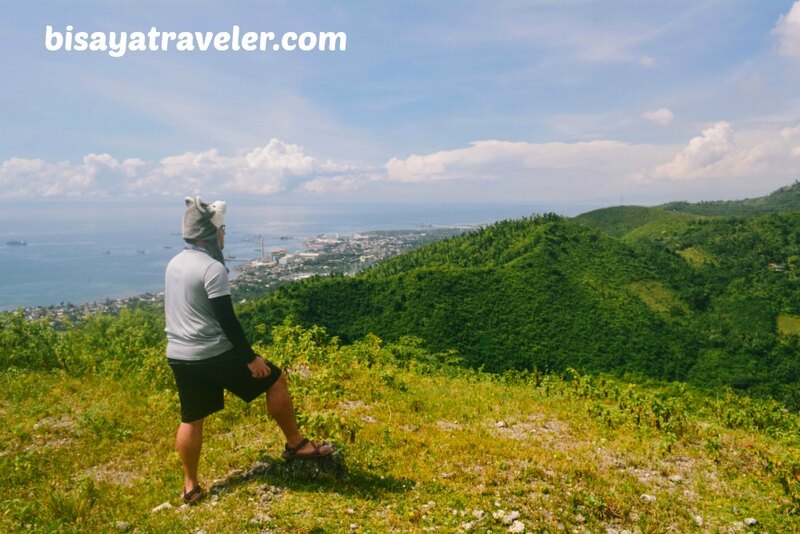 As what I’ve discovered a few days ago, we just missed a turn to this relatively unknown overlooking spot in Naga City, Cebu. And so, together with my crew, Team Bang, we ventured into the highlands of Naga to once again get a chance to scale this mountain. To make things even better, we were celebrating our first anniversary as a team on that memorable day, which I will write about on my next post. 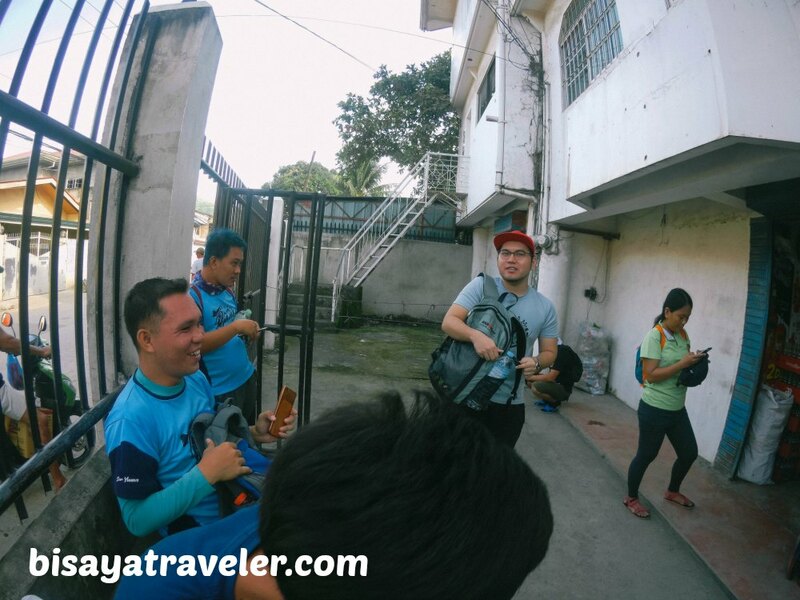 Our hike to Pangilatan Peak adventure or anniversary climb started with a rendezvous at a bakeshop in Tungkop, Minglanilla. Since it was a special day for Team Bang, I was joined by the team’s pioneers – Christine and Shenyl. 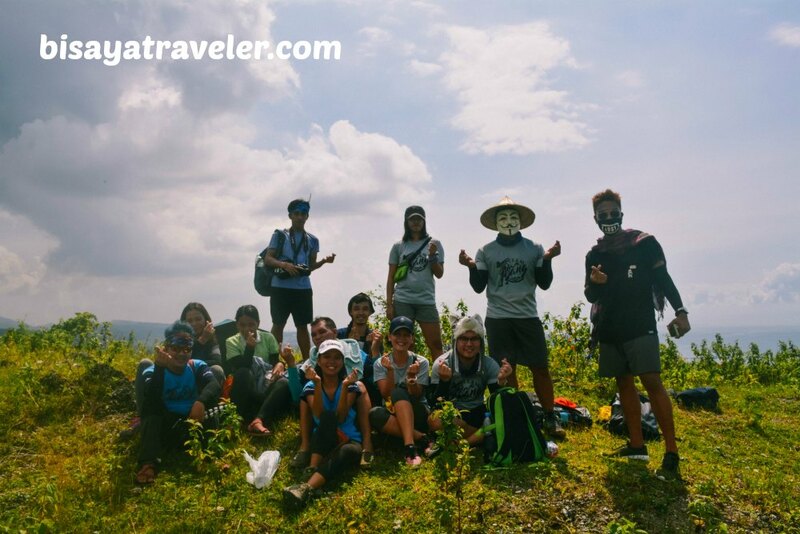 Of course, there were several other energetic and active members who tagged along for this hike, including Wilfred, Ate Sherlyn, Jovy, Karl, JP, Marc Jonell as well as the Besh Squad – Lieve (who looked like Dennis Rodman), Sadam and Jesh. To top it all off, we were also accompanied by the unit’s newly dubbed love team Meldol – Mel and Idol. 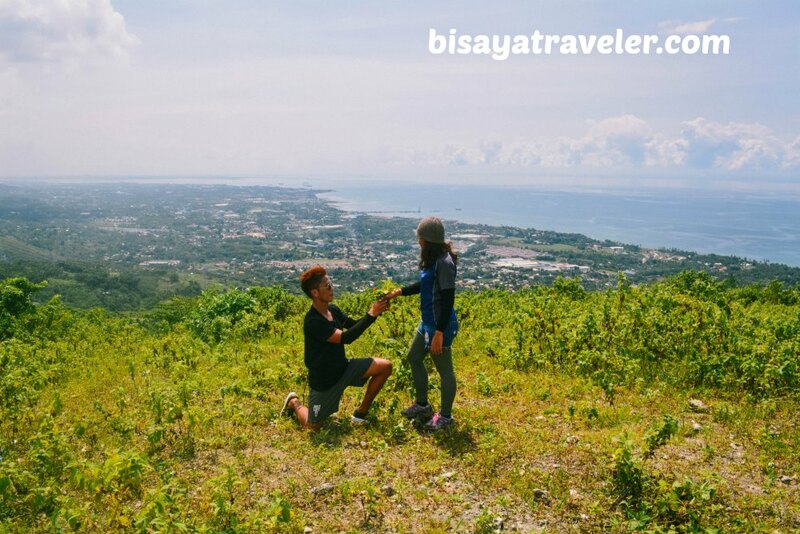 From the meeting point, we, later on, embarked on our anniversary hike with a bumpy habal-habal ride to our base – Sitio Pangilatan. Unlike our first visit to Pangilatan, our ride up wasn’t a breeze, by any means. As a matter of fact, we had to make a few stops because the road is too steep and the drivers thought we were a little heavy. Yikes! I guess we have to lay off those sugary soft-drinks and meaty siomais to lose some extra pounds. 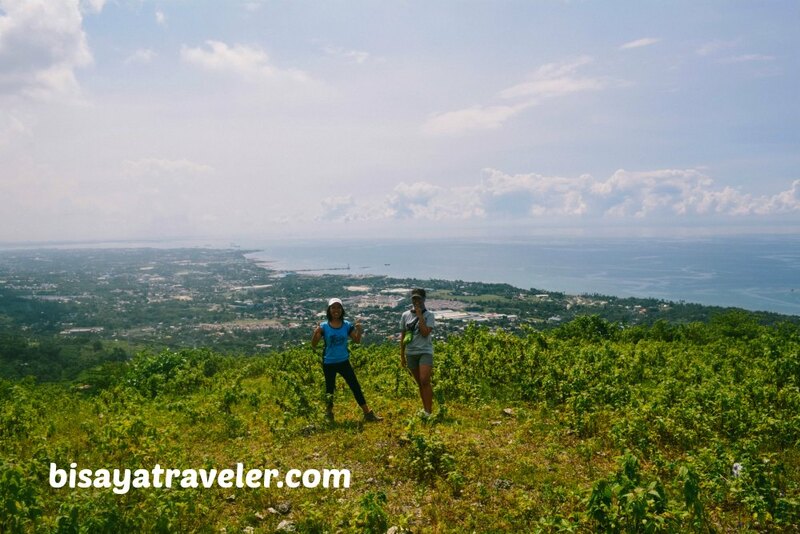 Eventually, we arrived at Pangilatan (not to be confused with Pangilatan Peak), where we were treated to a sweet view of Naga City, Minglanilla and Metro Cebu. 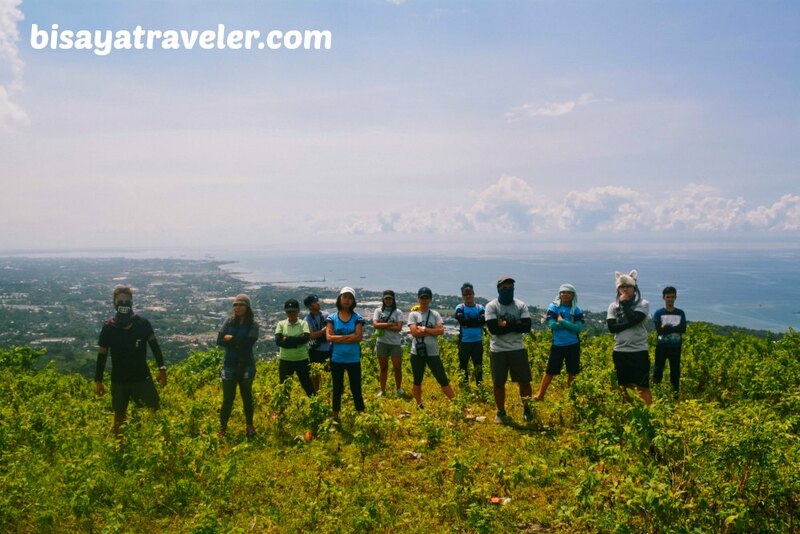 As part of our team’s traditions, we made a short prayer, before hitting the trail to Pangilatan Peak. With our official prayer leaders missing in action, we assigned this duty to Jovy, who by the way asked for blessings and guidance to everyone’s love-life. Quite an interesting choice of words from her, I must say. Formal introductions were a must too, especially since it was, for some, their first time seeing Idol and Mel. And boy, Idol did deliver a lively and showbiz, Jericho-Rosales-like introduction. Afterwards, we made a couple of poses on our base that looked like we were on a major a climb. Ever heard of the viral siksikan pose challenge? Yep, we did give it a shot too! Idol, however, didn’t get the memo, and was zeroed in on posing a romantic shot with Mel. Maybe, I was right from the get-go – Idol has extrajudicial feelings for Mel. Soon after, we walked on the trail to Pangilatan Peak, passing by small communities and locals doing their Sunday chores. Hiking with the seniors and pioneers of Team Bang felt like a walk down memory lane. 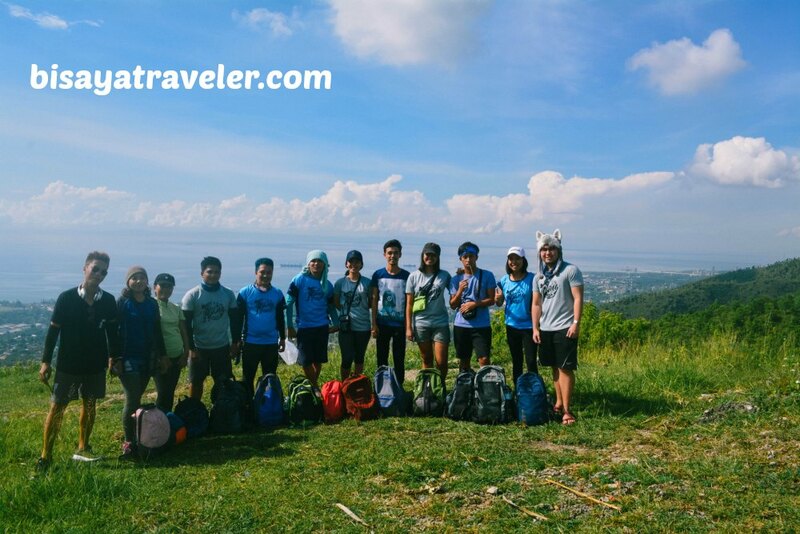 From our Badian-Candongao Peak traverse to our Mount Kapayas adventure, we reminisced about our fun-filled adventures in our first year as a team. And, it was an absolutely incredible experience, to recall some of the things we did as a team. 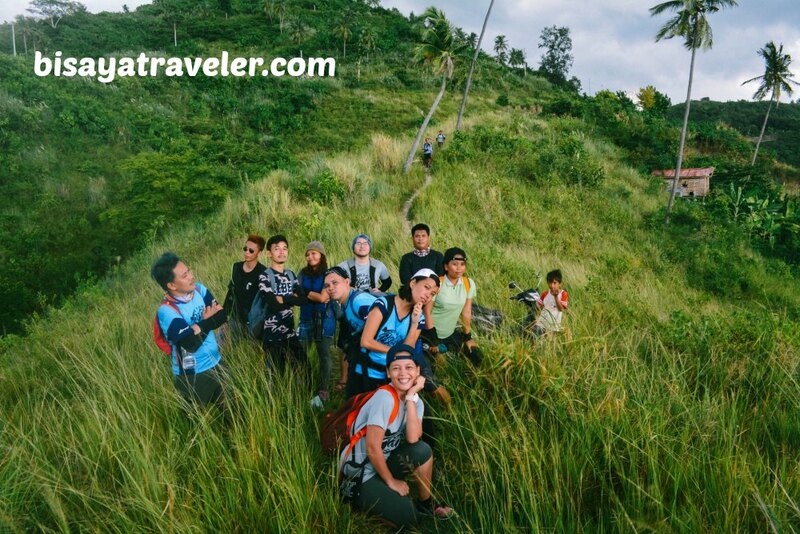 As were walking on the trail to Pangilatan Peak, I realized that we did a lot of positive things and experienced a plethora of thrills in Team Bang’s year one. Time moves so fast today that oftentimes we can’t appreciate what we have accomplished as of late. One of these days, I’ll be taking a pause for a while to take some time off, and just appreciate what we’ve done in the past 12 months. Aside from that, I also noticed Idol helping out Mel, from time to time, holding her hand like a passionate lover. I’m not sure if Idol is a bona fide stud/gentleman or a level 99 Hokage. My bet is the latter. Either way, it’s nice to see people helping their teammates and sharing fascinating stories on the trail. Moments later, we arrived at a crossing with a good view of the neighboring mountain – Mount Magdook. According to my source, this is where we missed a left turn on our first attempt to scale Pangilatan Peak. 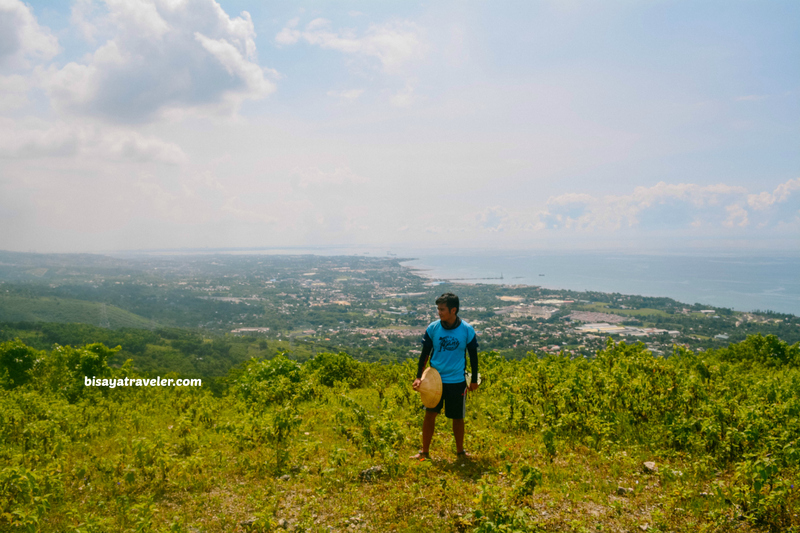 With Bo Jec’s recommendations and guidance, we took the not-so establish trail to the top of Pangilatan Peak. And just when we were about to ascend, a brown cow guided by its owner, appeared out of nowhere. If you’re familiar with Team Bang’s history, you probably know by now that farm animals haven’t been so kind to us. That’s why we got a bit alarmed, as the cow and its owner were descending and approaching us. Luckily for us, the cow was meek and as harmless as a dove. 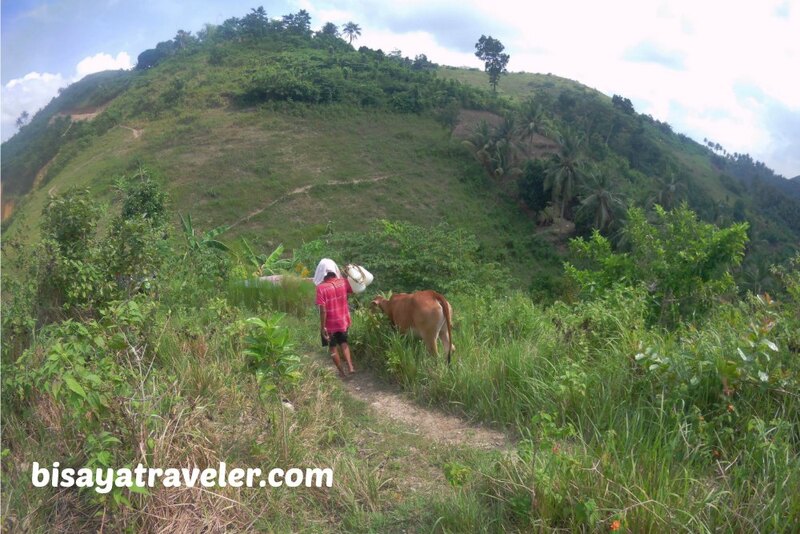 With cow out of our way, we climbed up to Pangiltan Peak, via a bushy open trail. As for the trail, it was fairly easy and short. Honestly, the only thing bothering was the scorching weather. Despite the heat and having zero hours of sleep, I wasn’t having any trouble at all on the way to our top. On the contrary, I was pumped up to see the real Pangilatan Peak. Minutes later, we arrived at Pangiltan Peak. Yippee! 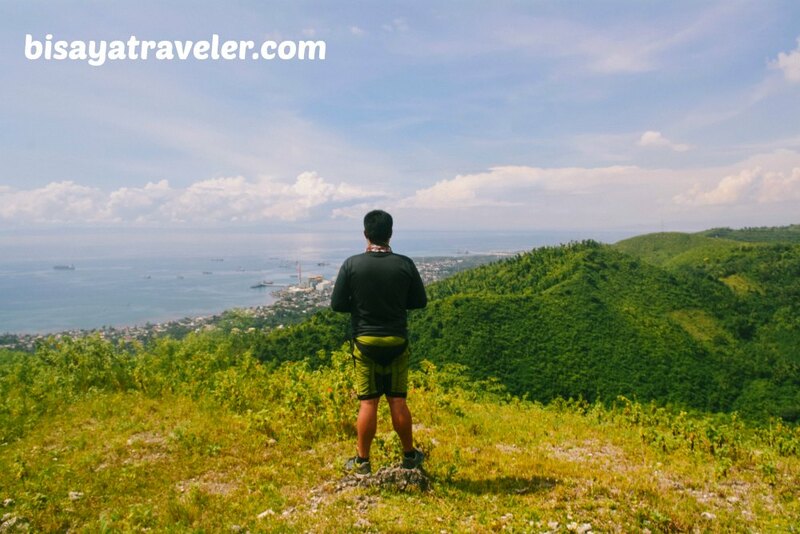 And finally, I got to lay my eyes on the breathtaking panoramas of Cebu, Naga and Minglanilla from this overlooking spot. Even though it was extremely hot, we took time to admire the views and cherish one another’s company. After all, it was our first anniversary together as a travel squad in Cebu. 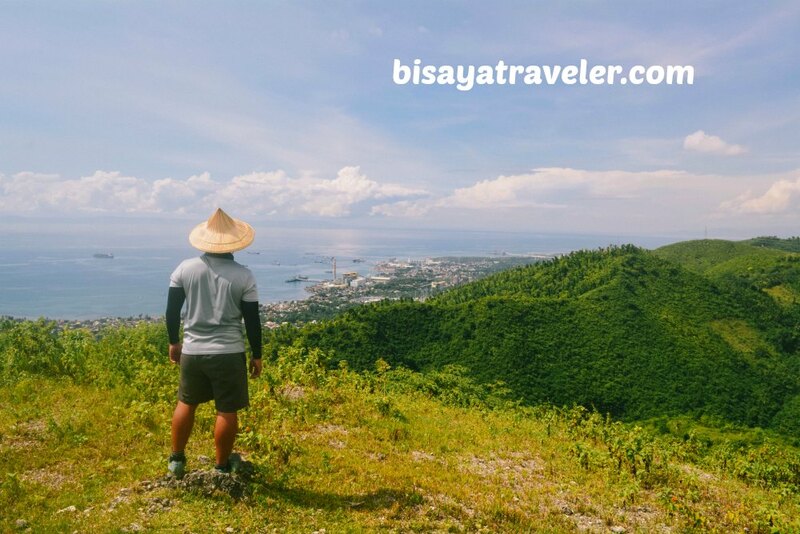 In my opinion, Pangilatan Peak is best visited early in the morning or late in the afternoon. There’s no tree or source of shade on top, meaning you’re fully exposed to the sun’s heat. 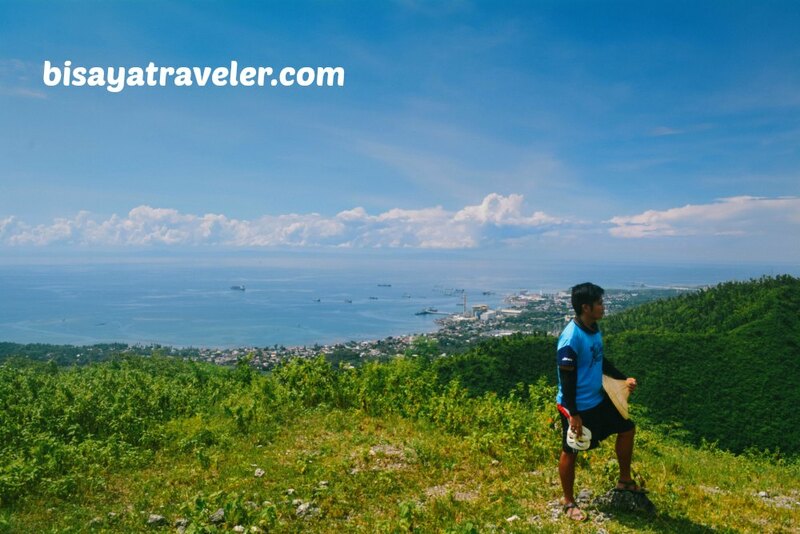 But, when it comes to the view, Pangilatan Peak is definitely lit, offering 360-degree panoramas. As usual, we took turns posing in different angles on the peak. 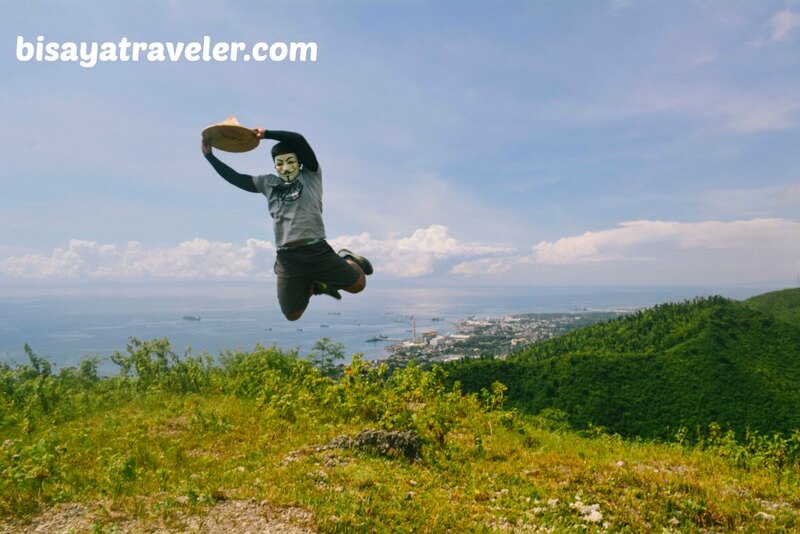 From jump shots to poses with the salakot, we did make heaps of solo snaps in Pangilatan Peak. While others were busy taking pictures, some took a breather, stretching their muscles and enjoying tasty snacks courtesy of Idol. And to end our visit to Pangilatan Peak on a high note, the team posed in front of the camera with our signature Dab Pose. Likewise, we did a handful of other poses on the summit. With everyone yearning for a sip of cold cola or lemon drink, we decided to go down to the crossing, and make our way to the next stop of our anniversary climb – Mount Magdook. 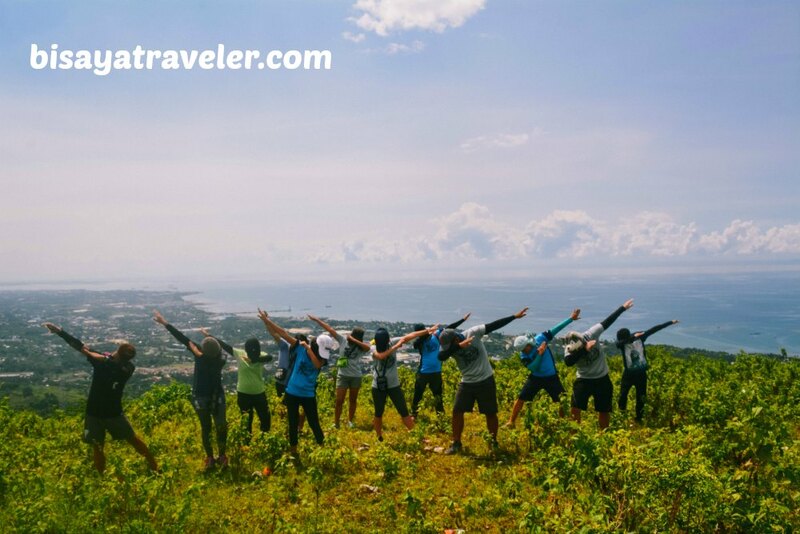 But, before we could move forward with our anniversary celebration, the tandem Meldol flaunted their trademark shot with Metro Cebu on the background. Will this budding friendship end on a positive note or a heartache for Idol? Is this all just a show or there’s a hint of reality to this romantic pose? We really don’t know. Hopefully, their friendship (or even more than that) will last long, as they continue to discover and witness Mother Nature’s beauty. Ultimately, we arrived at the Cantao-on community store, in which we indulged on some refreshing snacks. 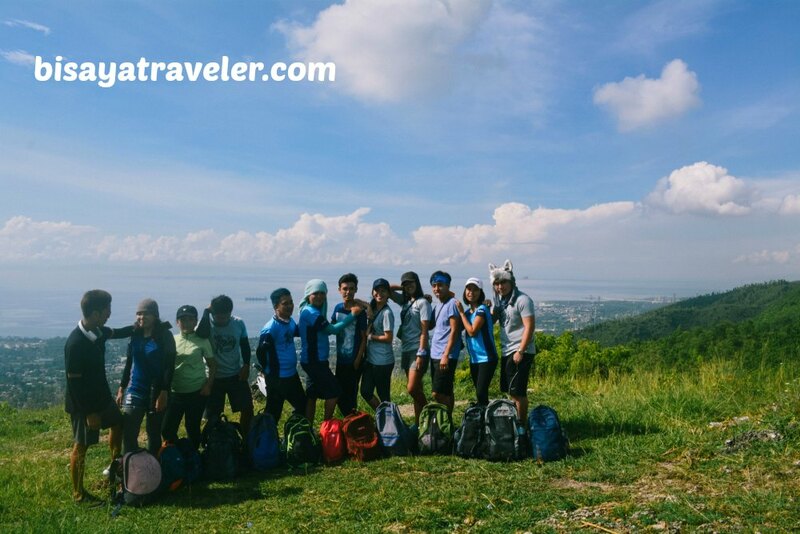 Our Pangilatan Peak adventure was, for me, an amazing hike with tons of beautiful sights. But, the thing is, our hike was just a start or a teaser of day filled with giggles and adventures. Stay tuned for the next post, mga besh! To get there, first you need to take a habal-habal ride to Sitio Pangilatan from Tungkop (Tinong’s Bakery). From there, ask the locals for directions. Since Pangilatan Peak isn’t really known (even to locals), I suggest that you show a picture of it. 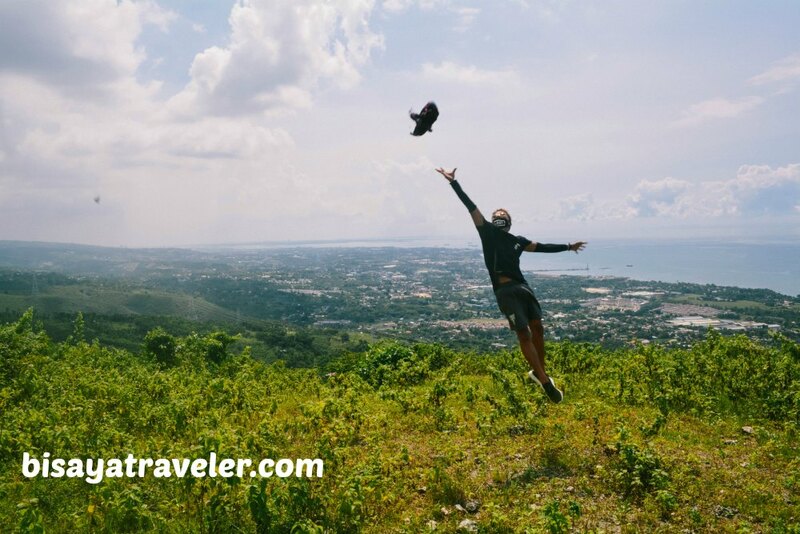 In addition, tell the locals that you’re heading to Cantao-an or Mount Magdook. Once you arrive at this crossing (photo below), head left, and make your way up to Pangilatan Peak. If, however, you need a guide, try to reach us, Team Bang, at our Facebook Page. If someone in our team is available, we’d be willing to show the way to Pangilatan Peak.